I am always open to a new idea when it comes to cooking, and enjoy watching cooking shows on TV. While watching Milk Street a couple of weekends ago, they demonstrated a new way of cooking chicken using a spice blend called za’atar. 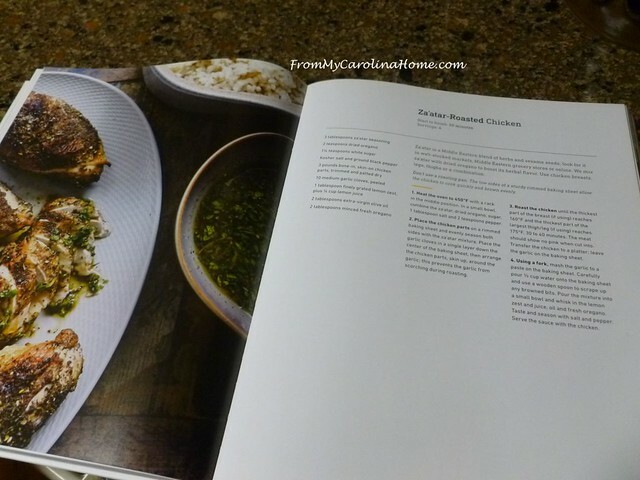 I looked it up in my Milk Street cookbook, and was delighted to find that the recipe was in my edition. I looked up the ingredients for za’atar and found it is a blend of dried thyme, oregano, marjoram, sumac, toasted sesame seeds, and salt. Sounded interesting, so I thought I’d give it a try. The blend was easy to find, although the vendor of this one spelled it differently, the ingredient list matched. I had almost everything else needed for the recipe in the pantry except for fresh oregano, so I substituted fresh parsley instead for the sauce. 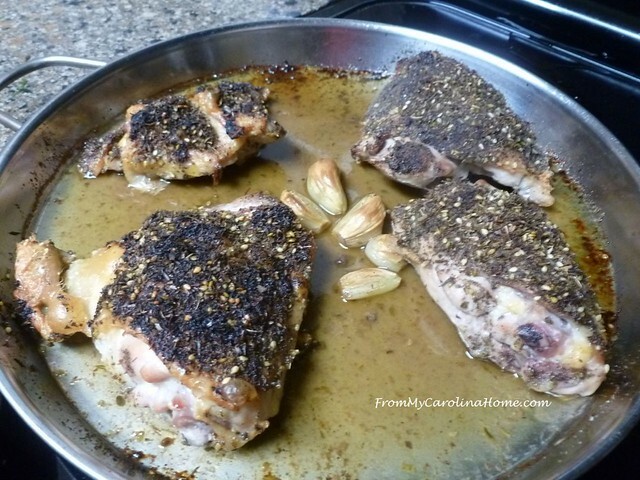 The spice blend is thickly applied, and fresh cloves of garlic are placed in the center to roast along with the chicken. The chicken is cooked in a very hot oven, using a low sided metal pan, to allow the chicken to cook quickly and brown evenly. Just 35 minutes later, and the chicken is fully cooked, with a wonderfully crispy skin. I did a couple of the thighs without the skin as well, just to see, and they were juicy and tender with the sesame seeds adding a bit of crunch. After cooking, the garlic in the middle is mashed up, and fresh lemon juice is added with a bit of oil and some fresh herbs to make the sauce. Served with fresh asparagus this time, it was a delicious meal. Get the recipe at the Milk Street website (not an affiliate, just a fan). You may have to enter an email address to see it, but it is free on the site for now. 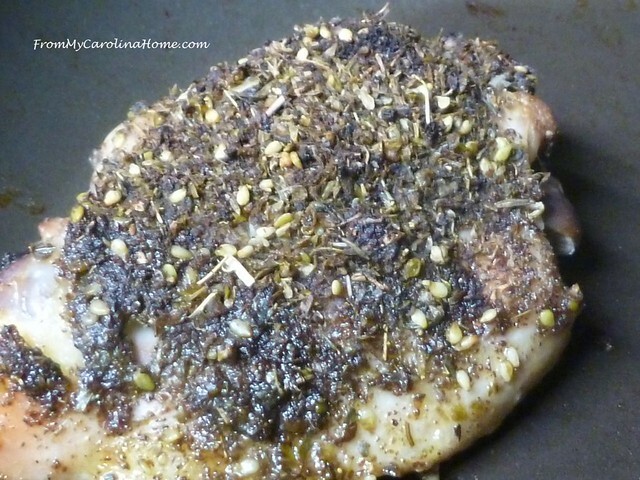 Za’Atar Roasted Chicken. Yum, a different flavor and one I’ll make again. Do you like to try new flavors? Get the Milk Street Annual Cookbook updated for this season’s recipes on Amazon (affiliate link). Interesting combination of spices. I do most of my chicken in the oven (usually thighs) and like to find new ways to dress them up. Thanks. Looks delicious. Now I know what to do with my za’atar! I love the flavors in the spice, and we have used it. However, I found that I have an allergic reaction; my fingers get very swollen after I eat it. After some thinking, I decided I am likely allergic to sumac. I’m sure it was delicious; it sure looks good! 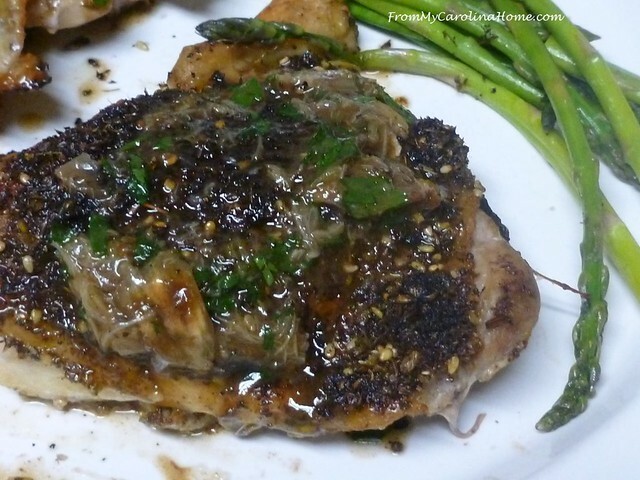 Perhaps make your own with the sesame seeds and spices leaving that one out, and then putting in some lemon-pepper to get the citrus flavor would get close. So happy you found Za’atar! 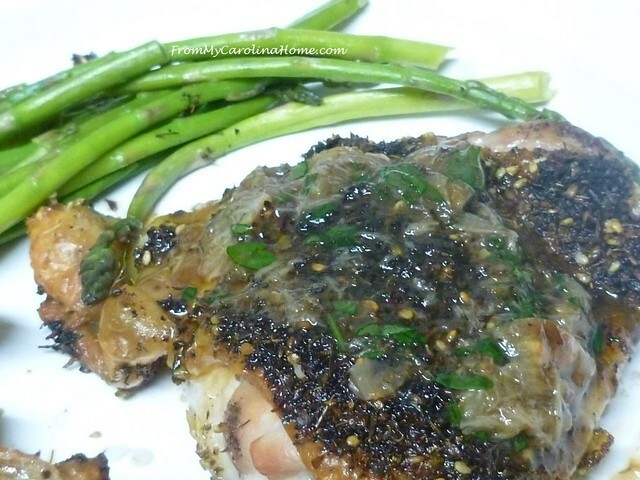 One of my favorites for baking, broiling, roasting or grilling almost anything savory. Add some to your garlic bread or rolls. Top it on homemade bread. I was introduced to a host of herbs and spices when I was very young and took my first job at a large company. Going to work everyday was like working at the UN, there were people from every place on the globe. And people brought food in to share. We had regular pot luck lunches and I loved them, and everyone shared recipes, many of which I still use today. Luckily I live where you can find lots of independent international food shops where you can find things not sold in big box grocery stores. Luckily Za’atar has found its way into mainstream grocery stores in most areas. Superbowl is rapidly approaching and we will be grilling up chicken wings for our guests with 5 different flavor profiles, Za’atar will be one of them! Thanks for the great recipe! Well Jes, you are learning your “something new for the day!” Check out these sites, the benefits and how you can use it. Even McCormick spices has it in many grocery stores in the spice section. It’s quite tasty! Hopefully you are not allergic to it. Used in many Middle Eastern dishes. Also has medicinal uses too. Hello Carole, This recipe sounds and looks delicious! I will have to share it with my husband and see when we will try it. 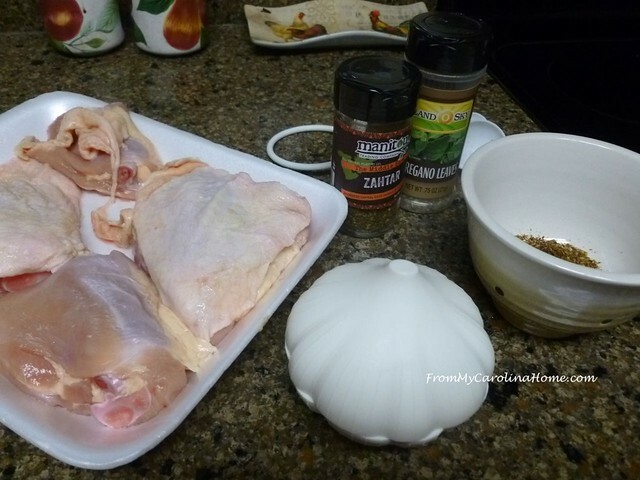 He loves thighs and I will use a breast, LOL, but we will both enjoy trying the new spice blend. The sumac is one I have not heard of, but it sure will be interesting to read the variety of links posted that have been shared. Thank you once again for sharing a new recipe! Have a fantastic day! I do like to try new recipes. Your chicken dish looks delicious. 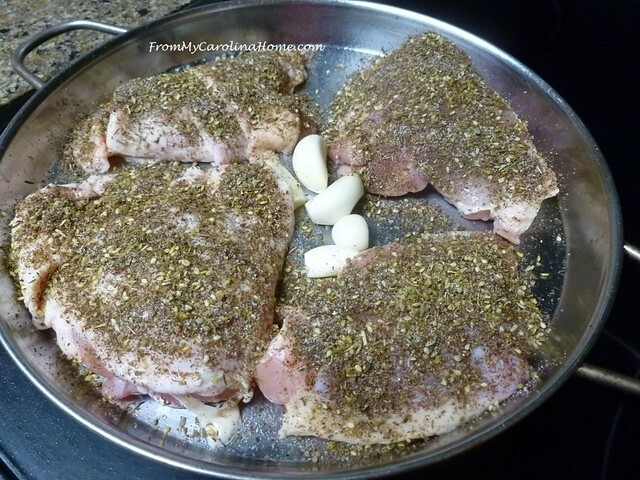 I like the seasonings called for in that recipe….stuff I usually have on hand except fresh herbs. Recently I bought an Instant Pot, so I’ve been experimenting. I have used pressure cooking for years; this pot slow cooks as well. It’s fun to experiment. I have absolutely no idea how this would taste, but I would try it! I don’t know what sumac is for a spice! I do have a chicken thigh recipe with a spicy rub that I learned in the chicken class on Bluprint. It has cinnamon, ginger and garlic in addition to a few other things, in the rub. DH and I love it, the kids hope I make it with the skin on so they can discard it all! This looks super tasty! I do like to try new recipes and new flavor combinations. yum, sounds so good and so different!